Traditional peasants on Lantau Island always carried a billhook tucked into their belts, like this restored one (left, and detail, below), using them for a wide variety of small jobs. But none of the stores stock them now, the small workshops that made them have gone out of business. What they do stock is a very inferior cutter that's the wrong shape for the job (no hook), has the wrong kind of grip, and is made of brittle, mass-produced steel that won't take an edge. Useless. After a lot of searching, we found a good billhook at a small store in Kowloon: good, hammered steel that takes a keen edge. It was also fitted with a socket for a handle, like the old one above, but the pitch was wrong, upsetting the balance, so we cut it down to a tang, flattened it, and set it into a strong wooden handle secured with a through-bolt (right). A Filipino friend offered to get us a billhook from the Philippines, so we gave him a template for a tool something like the new billhook. The blacksmith in his village didn't follow the template, but he let it influence him: the result is a something halfway between a billhook and a bolo, the traditional Filipino cane-cutting knife. We fitted it with a two-handed grip a bit like the hilt of a Japanese sword: shaped hardwood split in two, with recesses cut in each half for the tang, secured with a through-bolt and a ferrule at each end. This is by far our best cutter, light, perfectly balanced, and the progressive, downward sweep of the blade does the work for you, you don't have to hack away. It's much better than a machete. The blade-length is 33 cm, back thickness tapering from 5mm to 1mm. A Load of Old Billhooks  A Private Collection of Early Edge Tools: Bob Burgess, of Heytesbury, England, has been collecting old billhooks for years. Martindale sickle from the Chillington Tool Company of England, serrated, made from hot-rolled steel. Martindale sickle from the Chillington Tools distributor in Ireland and the UK, Chillington Hoes, Co. Mayo. Leonelli Attrezzi Agricoli da Taglio -- Italian traditional edge tool maker, dozens of different types of billhooks, sickles and more. This is a traditonal Chinese rice-harvesting "sickle", still in use up to 15 years ago. Note the tiny serrated blade near the top on the right, only 3" long. The "arm" is used to gather in the rice stalks, then the cutter is turned and the blade brought to bear. This is a truly primitive tool. Slow work! 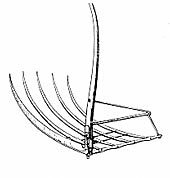 It took a long, long time for European reapers to figure out that a sickle has to curve backwards from the handle before sweeping forward to the point (see below). "Early cutting tools were animal jawbones with sharp chips of flint stuck in where the teeth had been, or crooks of wood, also with flint chips. These designs all used the idea of a hookthe tool was passed in behind the standing grasses and jerked towards the body. Early bronze sickles were also hefted at a right angle to a handle of wood or bone. The blade was eventually made to curve back to the right, and then was continued in a long curve to the point at the left. One man with a good sickle could cut up to an acre in a day. A man with a scythe could cut three to four acres a day. 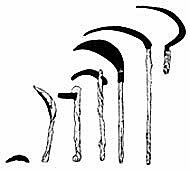 The standard scythe blade used today is 27.5 inches long, made of hammered steel in 26 separate steps, and curved in every dimension to optimize the cut. Older blades could be up to 4ft in length, usually used for mowing lawns. Scythes fitted with cradles or bows not only cut the grain, they scoop it up and lay it to the side out of the way in a neat swathe, ready for binding into sheaves, saving time and preventing wastage. Lantau islanders use a sort of sickle to cut rough weeds -- the rusty one below. We improved one of these (bottom) and serrated the edge at the end of the blade, which works much better, but it's still a far cry from a swept-back sickle. Iron and steel don't exist in nature in pure form and are not stable, quickly decomposing with air and moisture into iron oxide -- rust. Steel tools that cut plants and bite into soil contact plenty of moisture and must be kept clean to prevent rust. We've found biodiesel to be an excellent cleaner and lubricator -- unlike mineral oils, it's not toxic, ideal for organic growers. It protects against rust to an extent, but linseed oil gives better protection. Apply regularly. Here's a good way to remove all rust from steel tools. 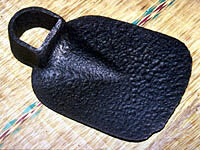 We've used it a lot in restoring old tools deeply pitted with rust. You need an ordinary car battery charger, lye (Red Devil or any caustic soda -- sodium hydroxide) and a plastic bath -- a standard 25-litre plastic container with one side cut off makes a good bath. Work outside -- the process emits some fumes. WARNING: Lye is highly corrosive, even though this is a weak mixture -- wear rubber gloves, keep clean water handy. Mix two tablespoons of lye with 10 litres of water in the bath. Attach the positive (red) terminal of the battery charger to a spare stainless steel kitchen knife or spoon and put it in the bath. Attach the negative (black) terminal to the rusted tool -- scrape some of the rust off first to make sure it makes good contact. Put the tool in the bath on a stone, not touching the knife. Switch on the charger -- the rusty tool (and maybe the knife) should begin to send off streams of tiny bubbles. Leave it on for 24 hours. If it's a large tool, take it out after 12 hours and attach the terminal to the opposite end to spread the effect. After 24 hours a lot of the rust will have flaked off, and the rest will have been converted to oily black stuff that can easily be scrubbed off in hot, soapy water. The tool emerges clean, all rust removed or converted, even into the deepest pinholes of corrosion. What you are seeing is the result of the electrolytic cleaning converting some of the rust, especially that most closely bonded to the surface of the iron, from conventional red iron oxide rust (Fe2O3) to black iron oxide, magnetite (Fe3O4). Because the red oxide is not truly bonded to the iron, the black oxide forms as a very fine film on the surface of the iron. The water and lye will combine with the magnetite in solution to give it the oily appearance and feel. The electrolytic process can be performed equally effectively and more safely with washing soda (sodium carbonate, not to be confused with the very similar cooking ingredient sodium bicarbonate) instead of lye. Washing soda can be found in many stores near the clothes-washing detergents. I have performed electrolytic cleaning like you described with washing soda and have been able to safely place my unprotected hand in the solution and handle the iron while the current is live -- though I wouldn't recommend it because of the chance of a shock. But I can tell you that the solution itself is quite safe. The electrolytic process, whether with lye or washing soda, generates hydrogen gas. That is the content of the bubbles coming off the iron. Ensure that there is plenty of ventilation so that there is no risk of explosion or fire. I usually do this outside.